A very taxing race in terms of concentration and tactics. We missed the Saturday race due to air consistently getting into the fuel system having just fitted a new pick up pipe that was bent to pick up from the middle of the tank. We concentrated too long on the joints we had remade however eventually we checked joints that we hadn't touched and to our great delight the engine then ran without a missed beat. Sorry to have left you all to battle the strong winds on Saturday!!! For Sunday's race we left Cowes about 06:30 and arrived at the start just as the first boats were coming out of the harbour. As there was no tidal difference along the line we plumped for the favoured pin end. Good start just on the leeward hip on Blazer, nice to see both Laser 28s first to cross the line (we think, Alchemist may have been in the front rank as well). We immediately tacked out towards the middle of the Solent to gain clear air. Soon after Blazer tacked with us and we realised Blazer was pointing miles higher but we were sailing slightly faster but not enough to hold what we were losing on pointing. OK until three quarters up the beat when Blazer who was well clear ahead tacked onto our wind and gave us dirty air. Instead of doing a clearing tack immediately we persevered in her lee and lost significantly as the rest of fleet closed quickly. Kites up for all after rounding Hampstead Ledge but with a failing wind and strong tide (we had managed to get to 0.3 mile from Solent Bank) we decided to head for the mainland shore before all forward motion disappeared. This looked awful to start with and we ended up over a mile from the mark but once in close to the shore we started to work our way slowly to the West and watched the fleet in the middle of the Solent drop back fairly rapidly. Eventually the wind started to swing to the South and with the telltale ripples on the surface of the water the sea breeze started to fill in between 12:00 and 12:30. White sails out to Solent Bank with a few class 3 and 4 boats and got round the mark as first in class, albeit at the second attempt Spinnaker run from there to NE Gurnard and single gybe for East Bramble. Towards the end of the run our speed started dropping and Shadowfax (Sigma 33) seemed to be closing fast. We rounded East Bramble then set off on a lovely tide induced wind beat to the finish with speed over the ground around 7 knots. 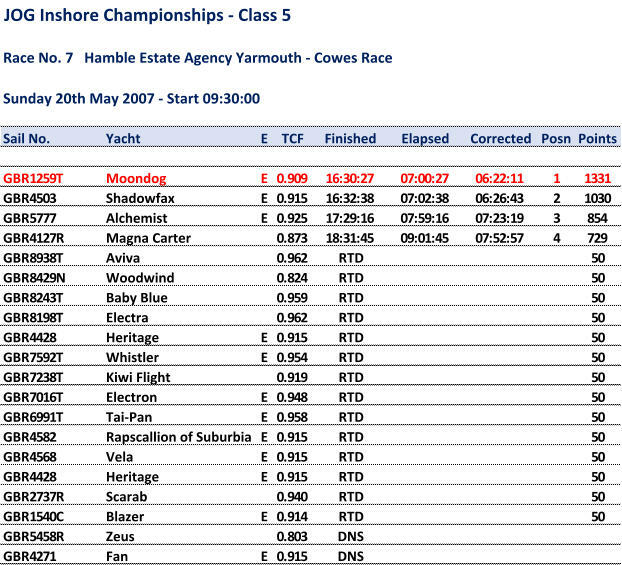 Fortunately Shadowfax didn't close anymore and we managed to get line honours in Class 5 and first on handicap. Lessons learned: we really will have to get this boat pointing higher and the classic cloud formation along the shoreline of small puffy clouds in the morning really does mean a sea breeze will establish itself, although not necessarily very strongly. We obviously enjoyed the race as we won but there were many moments of 'is this the right thing to do' and keep loose don't choke when in the lead.